The demand for non-toxic, organic and natural nail care products is accelerating. Moreover, with technological advancements, nail protective products and tools are also being developed that are easy-to-use and are more efficient. The nail care products that can repair and treat nails are also being offered on a large scale. The manufacturers are producing nail protection products, and nail masks using organic and food-inspired ingredients. The growing popularity of gel nail polish is also resulting in the manufacturing of new gel-based colors that last for a long time without resulting in breaking, dry or brittle nails. Use of sweet almond oil in development of various cosmetic products is also gaining traction. Sweet almond oil helps in keeping skin and nails hydrated and can also provide protection against harmful UV radiation. Massaging nails and surrounding area with sweet almond oil also helps in thicken and strengthen nails, hence, massage oils with sweet almond oil as the main ingredient is also being developed by manufacturers. As per the report compiled by Transparency Market Research (TMR), the global market for nail care is likely to witness steady growth during 2017-2022. The market is projected to register 5.8% CAGR and is also projected to bring in US$ 11,998.1 million revenue by 2022 end. Nail polish is likely to be one of the top-selling product in the global nail care market. By 2022 end, nail polish is projected to bring in nearly US$ 6,400 million revenue. Meanwhile, nail wraps/other extensions are also likely to witness robust growth during 2017-2022. With increasing demand for beauty products made using natural ingredients, nail polish manufacturers are also producing nail polishes made entirely of organic ingredients. Compared to the various sales channels, health & beauty retailer are likely to emerge as the most lucrative sales channel. Health & beauty retailer is projected to surpass US$ 4,300 million revenue towards 2022 end. Meanwhile, sales through e-commerce platform is also likely to witness robust growth during 2017-2022. Premium nail care products are likely to account for more than half of the revenue share by 2017 end. Premium nail care products are also projected to exceed US$ 6,800 million revenue by 2022 end. With consumers becoming more concerned about their looks and beauty, the manufacturers are offering premium beauty products that are safe and made using organic ingredients. Hence, customers are willing to pay a premium price for better products. Asia Pacific Excluding Japan (APEJ) is likely to emerge as the biggest market in the global market for nail care during 2017-2022. By 2017 end, APEJ is projected to account for more than one-third of the revenue share. Countries such as China, India, Thailand, and Malaysia are likely to witness growth in the nail care market. The demand for gel nail polish and bright color nail polish is also increasing, hence, driving the growth of nail care market in APEJ. Moreover, manicure and pedicure services are also popular in various APEJ countries, especially in China. North America is also likely to emerge as the lucrative market for nail care. Presence of major brands and the introduction of new nail care products are some of the factors driving the market growth in North America. The report also offers a detailed profile of various major market players such as Shiseido Company Limited, Chanel, The Estée Lauder Companies Inc., Procter & Gamble Co., L’Oreal SA, Avon Products, Inc., Colorbar Cosmetics Private Limited, LVMH Moët Hennessy Louis Vuitton S.E., Hindustan Unilever Ltd., and Revlon, Inc. The importance of nail care is rising, with increasing interest of consumers in nail treatment. Various brands are also developing new products for nail care. New treatment concepts are also being developed by nail brands. For instance, overnight nail care products like night creams. Nail color users are also becoming aware of chemicals, hence, manufacturers are using natural ingredients such as turmeric, milk, carrots, almonds, etc., in their products. The trend of anti-pollution cosmetic and personal care products is also rising. Anti-ageing products are also gaining popularity in the nail care products. Manufacturers are focusing on offering hydrating, smoothing, and strengthening products for nails. Along with the new type of nail polish, manufacturers are also focusing on developing new nail polish removals that don’t damage nails. There has been an increasing focus on the use of oil, soy-based formula and water-based formula as an ingredient in nail polish removers. The use of gel and long-wear nail polish is also rising, hence, the use of organic ingredients is also increasing to ensure the protection of nails. The report includes quantitative and qualitative analysis of the global nail care market. The report consists of various factors defining the market dynamics such as trends, drivers, opportunities, and restraints. The report also includes Porter’s five force analysis SWOT analysis and market attractiveness analysis of the global nail care market. The report also offers in-depth analysis and market opportunity analysis of the key developments in the industry, products, sales channels, etc. Key industry developments provide details on the factors that are likely to have an impact on market dynamics. These factors consist of the events that took place in the past and various events that are likely to take place in the future. The report also offers detail on various regulations affecting the global nail care market. An estimated market size on the basis of CAGR and US$ Mn has also been provided in the report. The global nail care market is segmented on the basis of product, sales channel, and price. On the basis of product type, the market is segmented into nail polish, nail wraps/other extensions, nail art, nail polish remover, manicure products, pedicure products, and other product types. On the basis of sales channel, the market is segmented into pharmacies, hypermarket, supermarket, e-commerce, health & beauty retailer, and other sales channels. In terms of the price, the market is segmented into economic and premium. Region-wise the market is segmented into North America, Europe, Latin America, Japan, Asia Pacific Excluding Japan (APEJ), and the Middle East and Africa (MEA). The report provides forecast and market size including both volume and value for each region and other segments. The CAGR for the forecast period 2017-2022 has also been provided for each segment. 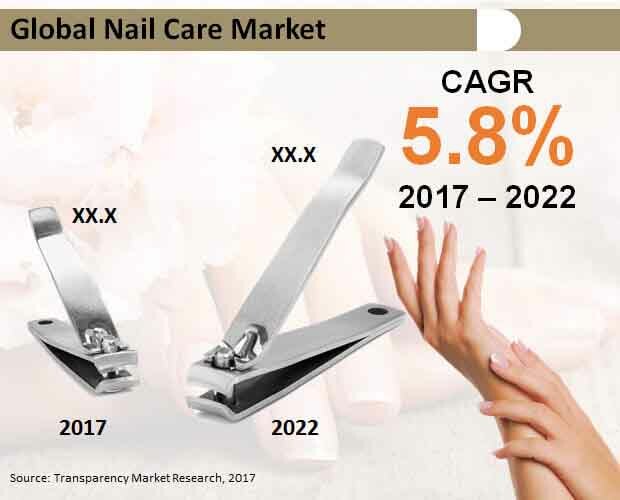 The report provides detailed profile of some of the leading market players in the global nail care market such as L’Oreal SA, The Estée Lauder Companies Inc., Procter & Gamble Co., Shiseido Company, Limited, Avon Products, Inc., Revlon, Inc., Chanel, LVMH Moët Hennessy Louis Vuitton S.E., Hindustan Unilever Ltd., and Colorbar Cosmetics Private Limited. Leading market players are following various strategies such as mergers and acquisitions, developing and offering new products, using various pricing strategies. The market players are also using different mediums to promote their products and attract customers.